With the end of the current season fast approaching, Saturday saw three of the Ainsty Road outfit's senior teams crowned champions of their respective divisions within the space of a few hours. Harrogate Ladies 2s celebrate after Saturday's 2-1 victory over Wakefield, the win that saw them wrap up the title. 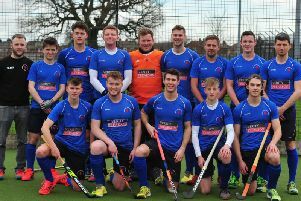 'Gate's Mens 1st XI, already promoted from North Division One, beat Wilmslow 5-3 to wrap up top spot, a draw between second-placed Leeds 2s and Ben Rhydding (3rd) leaving Tom Harris' side with an unassailable lead at the summit. Harrogate Ladies 2s, unbeaten at home all season and since the turn of the calendar year, took the Yorkshire Premier Division crown courtesy of a 2-1 victory over Wakefield. And the Mens 2s emulated the feat of their female counterparts, a 3-0 triumph away at Lindum ensuring that they edged out Kingston-upon-Hull by a single point in the Yorkshire Premier title race. With the Ladies 3s having sewn up pole position in Yorkshire Division Two a week earlier, what has been a fantastic 2018/19 will end with no fewer than four Harrogate sides toasting championship glory. Harrogate Mens 1s skipper Tom Harris in action during Saturday's triumph over Wilmslow. Elsewhere, the Ladies 4s are still in with a sniff of the Division Four North title, currently two points behind leaders Leeds 4s with three games remaining, while the Mens 3s ended up third in Yorkshire One and secured promotion.
" I am delighted, as you'd expect and there's a little bit of relief there to get over the line," said Mens 1s skipper Tom Harris of his team's success. "We'll have had 23 different players this season who have all played their part. That strength in depth has been invaluable. "It shows how good a place the club has been in this year. The 2nd XI won the Yorkshire Premier League on Saturday and the 3rd XI secured promotion into that same league for next year. 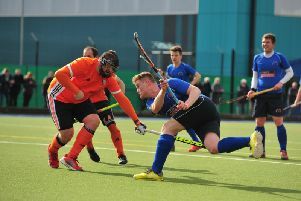 Harrogate Mens 1s celebrate one of the seven goals against Wilmslow that saw them open up an unassailable lead at the top of North Division One. "Obviously this means we'll all have a big challenge next season. But in clubs like this it is a case of a rising tide lifts all ships. "Playing good opposition on a Saturday forces you to raise your own performance. This in turn brings the individual quality up at training which lifts the standards for your team-mates around you." Harrogate Mens 2s took the Yorkshire Premier title.